What do we look for in the 19th Congress beyond reforms? The Chinese government has set the scene for the Politburo in terms of introducing more State Owned Enterprise (SOE) reform cases. We need to now think ahead to what else we can expect from the 19th Congress. The most important point to note in the Party Congress is changes of Party members in the Politburo. We expect any changes to consolidate Xi Jinping’s power at the top of the Party. And this suggests that reform and anti-corruption campaigns will continue. Xi Jinping will draw attention to still solid GDP growth even though the Chinese economy has been under supply-side reform, which has cleaned up companies in overcapacity sectors. In other words, from the viewpoint of the government, supply-side reform could be positive for future growth. 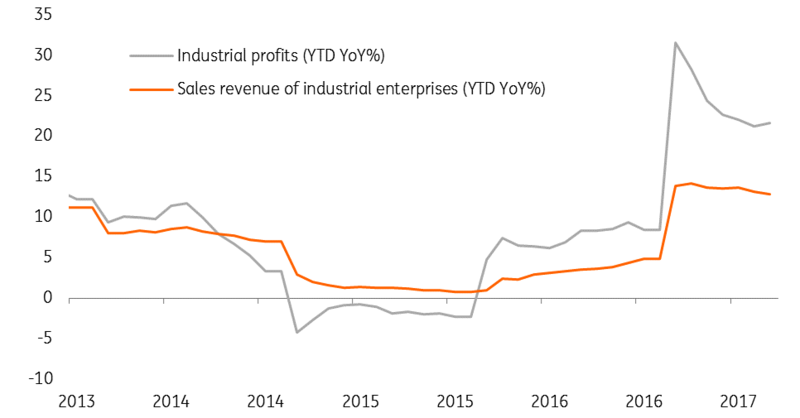 We agree on this point, as signaled by strong growth in industrial profits (21.6% YoY YTD in August 2017). If Xi Jinping cannot line up party members who are in his camp for roles at the top of the Party, then the anti-corruption exercise will likely stop. This would also risk the continuation of SOE reforms, and would put the sustainability of economic growth at risk for the next five years. If the anti-corruption exercise were to stop, there would be revitalisation of retail sales because of likely return of lavish spending. The market largely expects that the government to reaffirm its economic growth target of doubling GDP between 2010 and 2020 (which was set in the 18th National Congress in November 2012). But we think that the government will be more aggressive on this target because Chinese GDP reached 90% of the 2020 target in 2016. Our forecast of real GDP growth is 6.8%, 6.7%, 6.7% and 6.5% for 2017 to 2020. If GDP growth is in line with our forecasts, then Chinese GDP would be around CNY96 trillion in 2020. As the target of doubling the economy by 2020 is well within sight, we believe that the government will be more aggressive on growth. It may not set a specific growth rate but using the same wording as in the Government Working Report of “around 6.5%” for the decade into 2025. We believe that the government will be more aggressive on growth. If there is no reference to any GDP target, then the tone may change to highlighting reforms. One of the possible targets could be setting an upper limit of leverage ratios for SOEs and local governments. This might be seen as good news for the longer term (over 5 years) at the cost of short- to medium-term growth (2-3 years). We also expect to see plans to boost the economy by increasing the prevalence of high-tech and greater use of clean energy. Specific targets may be set for these industries. We do not expect any specific time frame or details on RMB internationalisation reform. Despite this, if the announced economic growth target is around 6.5% then it would give a sturdy fundamental background for CNY appreciation.